On the second day of the UN General Assembly in New York, Moon and Trump had a summit for the fifth times at Palace Hotel sided by Mike Pence, Ivanka Trump, Mike Pompeo, John Bolton, Kang Kyung-wha, Chung Eui-yong, Jang Ha-sung and Cho Yoon-je (Ambassador to the US). 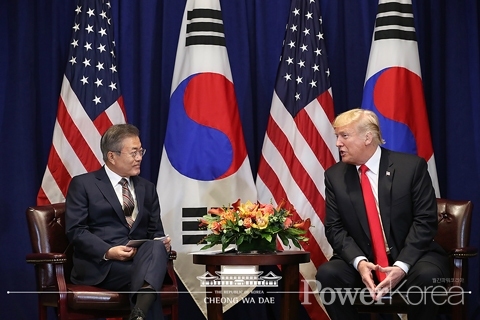 Trump pointed out that he and Moon had exchanged opinions on many issues with the Korea-US FTA as one of the main issues of the meeting this time and the re-signing of the agreement were good for both parties. He also mentioned on North Korean leader Kim and said that he thought Kim was rather open mindedness and had a wish to make a progress on certain things. Regarding the Korea-US cooperation he thought he and Moon were going on very well. Moon said "The new Korea-US FTA signing today will reduce trade deficit on the US part while increase the opportunities of Korean companies for export. The US made cars in particular will be seen in the Korean market in the future and it will play a role to secure new customers in both countries." President Moon and Indonesian President Joko Widodo had a summit on September 10 at the Blue House. The two leaders checked on the items of understanding made at the November summit last year and exchanged opinions on substantial cooperation in accordance with the special strategic partnership of the two countries. They discussed on cooperation in light railway, waterpower generation, infrastructure, steel, petrochemicals, intelligent transportation systems, IT, vehicle and agricultural products. In fact, the Korean consortium joined the first phase of the Jakarta Light Railway project of 5.8km and test opened the course in accordance with the opening of the Jakarta Palembang 2018 Asian Games; the project currently is on the second and the third phases. Moon and Widodo has agreed to simplify the visa procedure to activate personal and cultural exchanges and to launch 'Young Leaders Dialogue' on the suggestion of Widodo. Other cooperation areas discussed on the day include strategic communications on international issues covering environment and marine security and defense industry and national security. Moon explained the current affairs on the Korean Peninsula and asked Widodo a continuous support for denuclearization and permanent peace in the region. Moon also showed his gratitude to Widodo for inviting him and Kim (North Korean leader) to the opening ceremony of the Asian Games (Prime Minister Lee Nak-yeon and the North Korean Deputy Prime Minister of the Cabinet Lee Yong-nam attended instead). Widodo said in response that he would wish for stronger and closer bilateral ties between Korea and Indonesia.